Description: The office companion. 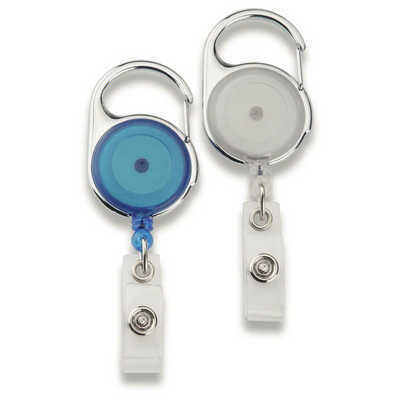 Blue badge holder with metal carabineer hook and retractable cord. Features: Features include pull reel with 24```` nylon cord and vinyl strap. Packaging: Polybag. Colour: Blue. Material: Plastic with metal clip and nylon cord & vinyl strap Product Size: 35mm Ø x 100mm(l). Freight details: 1000 per carton, 21.6kgs, 33 x 27 x 49cms; Decoration Type(s): Colour Print / Full Colour Print . Decoration Area: Pad: 16mm Ø. See drop down menu for decoration options.